Timothy O'Sullivan Civil War Photo of the 50 NY Engineers HQ at Petersburg 1864. Albumin photograph of the 50th New York Engineers Headquarters at Petersburg, Virginia. By the famed Civil War photographer, Timothy OSullivan. The unmounted photograph measures approximately 9 x 6.75. 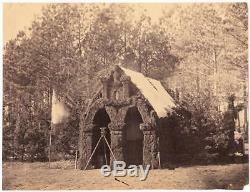 It shows the elaborate tent headquarters constructed by the unit complete with evergreen-lined outside walls and double-arched entrance topped with a large triple-turreted insignia of the U. A tripod-mounted theodolite and the units colors stand in front of the structure. The photograph is annotated in pencil 248 on the reverse. It is in nice shape with two small mounting remnants on the reverse and some wear at its lower left tip. Timothy OSullivan began working for Matthew Brady well before the start of the Civil War in Bradys Washington, D. Studio under the supervision of Bradys assistant, Alexander Gardner. In 1862, he and Gardner first achieved fame documenting the battlefield dead at Antietam when their photographs were exhibited in New York City. However, both men became disgruntled by Bradys megalomaniac instance that only he. Official credit for the images, so the pair parted ways with Brady. Gardner, assisted by OSullivan, started his own company in 1863, and they arrived at Gettysburg just in time to capture a stunning series of photographs of unburied Union and Confederate dead on the battlefield. Both men continued to photographically document the rest of the war. This photograph was taken by OSullivan the fall of 1864 following the fighting at Peebles and. Farms when of the 50th New York Engineers was garrisoned in a five-acre field on the Flowers Farm by Poplar Springs Church near Petersburgh. There, the unit constructed its quarters for the winter. One of the 50ths officers, Captain William Folwell wrote in his diary that some of the officers are putting up quite elaborate houses. I mean to have as good a house as can be built of the material accessible, viz. Green pine timber and canvas. OSullivan may well have been the most prolific cameraman of the Civil War as the Library of Congress has curated about 700 images attributed to him. View My Other Items For Sale. I know that this can be expensive, but I've switched to this method because I've had too many claims of non-receipt by international buyers. Please don't assume anything that is not specifically stated or shown on this listing page. This is a Read'Em Again Books sale. Read'Em Again books is a member of the Antiquarian Booksellers Association of America (ABAA), the International League of Antiquarian Booksellers (ILAB), the Ephemera Society, the Manuscript Society, the American Philatelic Society (APS), the U. Philatelic Classics Society, and the Military Postal History Society (MPHS). We think that you'll find our prices to be very competitive with other internet book sellers. In addition to a nice selection of Americana, diaries, journals, photograph albums, and other unique personal narratives, we also maintain a small stock of children's books, illustrated books, unusual non-fiction as well as ephemera, philatelic items, prints, sheet music, maps, and occassionally postcards, antique toys & games, tobacciana, and breweriana. Get images that make Supersized seem small. Tailor your auctions with Auctiva's. The item "Timothy O'Sullivan Civil War Photo of the 50 NY Engineers HQ at Petersburg 1864" is in sale since Saturday, November 24, 2018. This item is in the category "Collectibles\Militaria\Civil War (1861-65)\Original Period Items\Photographs". The seller is "ksanftleben" and is located in Dumfries, Virginia. This item can be shipped to United States, Canada, United Kingdom, Denmark, Romania, Slovakia, Czech republic, Finland, Hungary, Latvia, Lithuania, Malta, Estonia, Australia, Greece, Portugal, Cyprus, Slovenia, Japan, China, Sweden, Indonesia, Taiwan, South africa, Thailand, Belgium, France, Hong Kong, Ireland, Netherlands, Poland, Spain, Italy, Germany, Austria, Israel, Mexico, New Zealand, Singapore, United arab emirates, Qatar, Kuwait, Bahrain.